Michael Christopher Designs is a custom design company servicing clients in Brisbane looking for truly unique kitchens, laundries, entertainment units and office and outdoor spaces. In addition to custom cabinets, we also offer Interior Design and Appliance, Tile & Flooring selection. With a 26 year background in kitchens and appliances, our mission is to create spaces that create perfect harmony between form and function within your chosen budget. Kitchens by Kathie is a family owned business specialising in the design, manufacture and installation of fully made-to-measure cabinets. Recognised as a Queensland tradition of craftsmanship and service, Kitchens by Kathie has been proudly supplying exceptional quality since 1973. Whether your home is a traditional Queenslander or a modern open plan apartment, our team of friendly, professionally trained, experienced & open minded designers have the knowledge, expertise & creativity to work with you to design both functional and beautiful cabinetry to suit your home and your own personal taste. All our cabinets are totally made to measure and can be manufactured and supplied to you in flat pack DIY form, or assembled in our factory, or fully installed for you by our in-house QBCC-licenced team. Whether your are planning a full kitchen renovation with all new cabinetry, or would like to give your existing kitchen a makeover by replacing your doors and drawer fronts or benchtops, we have the know how and creativity to create your dream kitchen. Based in Brisbane, we service the greater region from the Gold Coast to the Sunshine Coast and take a pressure-free, no obligation approach and will always put your needs first. Our skill for design and craftsmanship combined with solid experience in this industry lets you know that we know what we're doing. We can design any room in your home and supply a wide range of products from flat pack cabinets, to wardrobes and DIY kitchens. With the most up-to-date technology and state of the art computerised machinery, the quality of our cabinet work is always of the highest standard. As designer-manufacturers, our overheads are low, and we are able to pass the savings on to you. You'll find our prices extremely competitive, without compromising quality. Kitchens by Kathie and all other rooms too - Wherever you need a cabinet you need Kitchens by Kathie. Based in Brisbane’s Inner City Northside, Brilliant Bathrooms and Kitchens specialise in creating contemporary classic interiors. We work closely with our clients, listening to their ideas to produce designs that complement their interiors, are beautifully functional and classically timeless in style. We understand that choosing tiles and fittings for your bathroom or kitchen can be quite daunting, so we’re happy to accompany you through the selection process. We can visit a number of carefully chosen suppliers of quality products to make your selections a breeze. As registered builders, we can also help you with all your difficult jobs like changing a window or moving a wall. Our expertise stretches way beyond the bathroom and kitchen. We believe in managing every aspect of your renovation project from concept to completion, keeping you in the loop to ensure a hassle-free experience. Kitchen Gallery (incorporating Kit Kitchens) is a family kitchen manufacturing business with over 40 years experience. Over the course of almost 4 decades, Kitchen Gallery has won many industry awards, including HIA Best Value for Money Kitchen and finalist for Kitchen Designer of the Year. How did we become so well known for our kitchen designs in the greater Brisbane area? We strive to constantly improve our design and manufacturing processes, and have a proven history of providing the highest quality kitchens at an affordable price. We use Australian made board for the cabinets. The drawers and hinges are quality European made hardware,which come with a lifetime warranty We would like to take this opportunity to thank you for considering Kitchen Gallery to be involved in the creation of your dream kitchen. Should you have any queries, please do not hesitate to ask one of our kitchen consultants. Tranne A.C. Interiors is a Kitchen & Cabinetmaking manufacturer working with the direct public. We are a family owned and operated business with over 25 years experience, and service a 30km radius from the Brisbane CBD. We have an established reputation for quality and reliability which is the reason why we manufacture and install all the work ourselves from start to finish. We do not employ subcontractors unless a plumber / Electrician or Plasterer is required for the job. We will not leave a job until we are sure that the client is completely satisfied with our work. All our Cabinetry works are guaranteed for 10 years, all the Blum hardware we use have a lifetime warranty. As a business, we pride ourselves friendly service, integrity and high-quality workmanship with an emphasis on client satisfaction based on their specific needs. We provide comprehensive in home consultations where we explore your wish list and advise what options and different kitchen elements are available. This process is completed in your presence and with your complete consultation. This process is all about designing a kitchen to meet your needs. After all it is your kitchen! Our quotation process is within 7 days of our meeting. You can expect a fixed price for the supply of your kitchen with any options listed separately. Together with this, you will find a detailed list of the Trades Estimates for your job. We are not a high pressured sales organisation so we simply present the best design possible at a competitive price and hope that you will feel comfortable with us enough to entrust your renovation project with us. With the myriad of benchtops, hardware and cabinetry options it can be challenging to put all of these together. We will help guide you to select finishes that will complement existing architectural features and furnishings to ensure your new kitchen stands out from the crowd. Clear and precise communication is paramount to a successful project and a fully documented process will save any misunderstandings. We strive to ensure that the installation process doesn’t provide any surprises. – The typical fit out of a new kitchen takes around 2 &amp; 1/2 weeks from commencement. For most people you will be without a kitchen for this time and this can be very inconvenient. It is our job to ensure that the project is not unnecessarily delayed and is completed within the smallest time frame possible. This takes expert coordination of all of the trades associated with your project. We will keep you updated each step of the way so you won’t be wondering what happens next and you can be assured of our complete dedication to completing your project on time and with a minimum of fuss. We have assembled a great team of tradespeople who you will find are similarly committed to ensuring your complete satisfaction and have been chosen not only for the quality of their workmanship but also their exemplary attitude. From order normally your kitchen would be ready to be installed within 3 – 5 weeks depending on the cabinetry chosen. Our complete dedication to ensuring that your kitchen renovation is hassle free but should something unforseen happen, any issue will be resolved as quickly as possible. 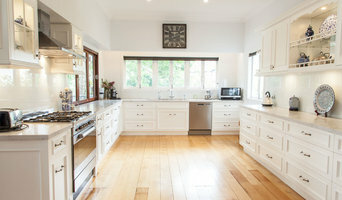 Craftbuilt Kitchen's is Brisbane's leading kitchen renovation specialists. With over 40 years of experience, we guarantee outstanding quality and service. Whether you are looking for kitchen renovations or kitchen designs, our team of consultants, designers, cabinet makers and tradesman will bring your dream kitchen to life. We pride ourselves on providing our clients with a confidence that they will be looked after before, during, and after we have completed their installation. Our Design Team have an uncanny ability to listen and understand what you the client, are trying to achieve. A combination of functionality, practicality, symmetry, and your vision are put together to help create your ideal kitchen. Visit our modern kitchen design studio at Stones Corner and meet our friendly experienced staff. As we are stockists of high-quality Kleenmaid European designed appliances, we can offer knowledgeable advice across the range to suit all budgets and requirements. We have a traditional cabinetmaking background and use a lot of new and innovative materials and techniques. We are flexible to work with and everything we make is custom made based on what you'd like. We encourage to get you involved in the design process and will invite you into our workshop to see the progress of your project. This way we can make sure that you're happy with project and that we can make any changes for you if we need too. You dream it we build it. We have the tools and skills a wide range of materials - sustainable recycled timber, timber veneer, Naturastone (7mm stone), metals, polished metal, mirror polish, stainless steel, solid surface, plastics, licensed to use solid surfaces (such as Hi-mac's and Laminex freestyle) and a range of sustainable materials. 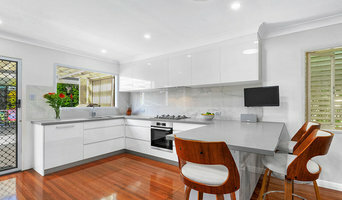 There are many types of kitchen professionals in Wynnum, Queensland – from cabinet makers, to carpenters and interior designers – and many trade professionals offer a full suite of expertise. Depending on the size of your kitchen renovation, and the kitchen designer, they may also hire contractors on your behalf and manage the project from beginning to end. Here are some related professionals and vendors to complement the work of kitchen & bathroom designers: Kitchen & Bathroom Fixtures, Appliances, Tile, Stone & Benchtops, Joinery and Cabinet Makers, Carpenters. 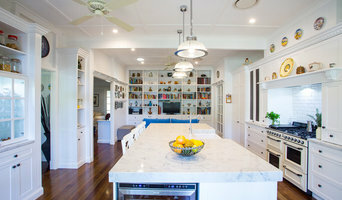 Find a Wynnum, Queensland kitchen designer on Houzz. Browse the Professional section on Houzz to find kitchen designers in Wynnum, Queensland. Then, scroll through photos of their latest kitchen renovations and see how their work compares to the scope of your project. You can read reviews to see how other homeowners rate their work, and message them directly to to ask any specific questions.